This photograph is of a roadside exposure of loess (wind-blown dust) at Aokautere, near Palmerston North. 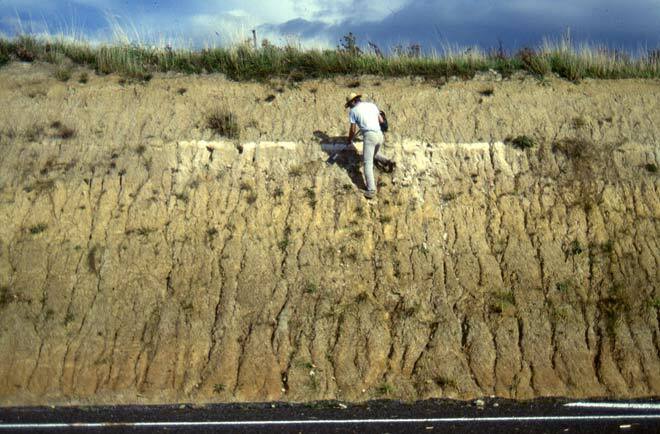 The thin white layer in the upper part of the cutting is Oruanui ash, produced when Taupō erupted about 26,500 years ago. Oruanui (previously named Aoukautere or Kawakawa) ash is the most widespread ash from an eruption in New Zealand during the last 100,000 years. It is found all over the North Island, and has been identified in the South Island and as far offshore as the Chatham Islands.